Despite sounding like a really advanced feature, reality is much simpler. Up to 8 users can be accommodated. 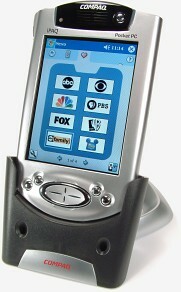 Users cannot have completely customized devices or activities, but rather a personalized Favorites section. For quick configuration, one user could duplicate another user’s favorites list. Finally, up to 8 rooms can be configured. Rooms are essentially other home screens – each of which can hold 14 devices or activities. Users cannot have specific devices or rooms assigned to them; everyone works off a “master” list. 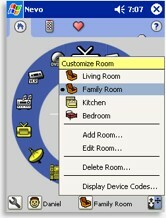 Users and rooms are selected via two small icons at the bottom of the home menu. Each user and room can also have a small icon assigned for quicker recognition – or that personalized feeling! GUI customization: little to do. Despite being backed by the most advanced hardware to ever grace a handheld remote control, the Nevo is decidedly slim on real customization options. However, I’ve been assured that this is merely the first Nevo version and there’s more fantastic stuff to come. So, first the bad news: the default Nevo interface can’t be changed. The wheel-based home screen, the background colors, the 3-by-5 grid button layout... none of those can be customized or modified to suit your particular needs. In addition, button sizes cannot be changed and there’s no provision for customized text headers or “frame” bitmaps (images that appear on-screen but don’t do anything). Only one font size is supported, which gives enough room for a 4 to 7 character text label, on average, in the default oval button shape. Longer labels positioned beneath buttons can be turned on or off. Files cannot yet be shared amongst users. As mentioned earlier, new devices can be downloaded from MyNevo.com, but UEI hasn’t incorporated any way for Nevo owners to easily share their work. This capability was a crucial aspect of the Pronto’s ultimate success. Now the good news: you can customize a button’s appearance, if not its dimensions. 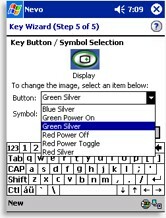 In-device buttons must be 44x31 pixels, while device icons can be 48x48, 44x31, 24x24 and 20x20 pixels in size (various sizes are used in different places). Room and user icons are 22x22 pixels, while favorite channel icons are 67 by 37 pixels. Some color and shape options are available right on the Nevo, but new icons not included in the default software package can be downloaded from the MyNevo website. Another option is to create your own from scratch and place them in a special directory. The Nevo operating system supports full 16-bit images, so graphics look excellent with no dithering problems. The Nevo makes good use of the iPAQ’s 5-way menu joystick, effectively giving them triple-way control: volume and channel, transport, plus menu control. If desired, punchthroughs can be configured on a room-by-room basis for channel, volume and transport controls.